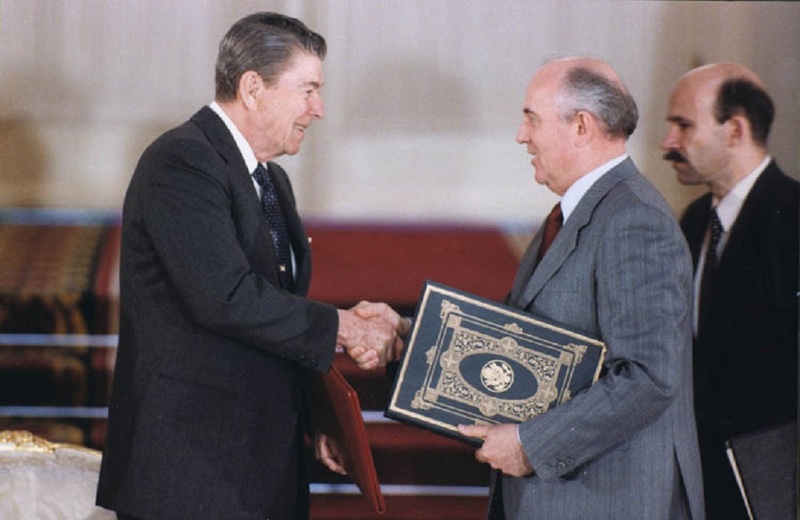 Signed by Ronald Reagan and Mikhail Gorbachev in the final years of the Cold War, the Intermediate-Range Nuclear Forces (INF) Treaty celebrated its 30th anniversary on December 8. Yet, its survival is currently at risk, as both Washington and Moscow accuse the other of being in violation of the treaty. If the treaty crumbles, ground-based medium-range missiles (falling between 500 and 5500 km) will once again be allowed in the European continent. Preliminary talks on a INF Treaty started in 1981, shortly after Reagan made his Zero Option proposal, which aimed to achieve the withdrawal of all the deployed Soviet and American INF systems from Europe. However, they would fail two years later after the Soviet Union decided to abandon the negotiations, following the deployment of an American Pershing II weapons system in West Germany (p. 232). Still, already back in 1979 the NATO Double-Track Decision was made, offering the Warsaw Pact equal ceilings on medium-range ballistic missiles. On January 15, 1986, Gorbachev famously declared that by the year 2000 the world would be free of nuclear weapons. The statement received a positive response (p. 207) from Reagan, who stated that the two countries were pointed (and had started to move) in the right direction together – towards reduction, and eventual elimination of nuclear weapons. The President also extended his hopes that a window of opportunity for improving relations between the two countries had been opened. Such declarations were important for Gorbachev, who wanted to put an end to the arms race, withdraw his troops from Afghanistan, and attract Western capital into his country’s economy – goals that could not be reached without improving relations (p. 78) with the U.S..
As such, after a series of meetings taking place in 1986, Reagan and Gorbachev agreed in principle to remove their ground-based INF systems deployed in Europe (p. 170), as well as to an equal reduction of their arsenals to 100 INF missiles warheads (deployed in U.S. territory and Soviet Asia). Since then, the possession, production, or testing of such missiles (with conventional or nuclear warheads) is forbidden. The arms control movement gained momentum, and by 1991 there had been significant cuts by both the U.S. and the U.S.S.R.. In January, 2007, the Bush Administration announced it would start formal negotiations with the Czech Republic and Poland for the installation, in their territory, of a ballistic missile defense system. Seeing the proposed shield as a threat for Russian deterrence, and despite American assurances that the system targeted Iraq, and would be unable to counter Russia’s immense nuclear weaponry, Moscow warned that it might withdraw from the INF Treaty (p. 19-20). Since 2011, evidence that Russia has acted in violation of the INF Treaty has been piling on, possibly going back as far as 2008. However, formal accusations were only voiced in 2014, in a period when Russian intervention in Ukraine was brutally straining relations between the two countries. Thus, Washington accused Moscow of testing a new ground-launch cruise missile, and urged the latter to return to compliance. In April, 2017, as well as more recently, the U.S. have accused Russia of deploying a prohibited intermediate-range ground-launched cruise missile. The Trump Administration has claimed that addressing Russian violations of the INF Treaty is a top priority, and U.S. Congress has also given the Pentagon authorization (and allocated $58 million dollars) for the development of a new intermediate-range ground-launched cruise missile. While research on the matter would not be in breach of treaty obligations, a later testing phase certainly would, although the United States claim to be committed to their treaty obligations, and stated that such initiative would be terminated in case of Russian full adherence to its related international obligations. Sergey Lavrov, Russian Foreign Minister, has vehemently denied U.S. allegations, claiming that his country is complying completely with the terms of the treaty. In fact, Russia is throwing its own accusations. Particularly, regarding the U.S. drone program; the missiles that have been used by the U.S. to test anti-ballistic missile technology; and the placement of launchers that can be used for intermediate-range missiles as components of the AEGIS shore deployment set in Eastern Europe – initiatives that technically violate the terms of the treaty. In addition, the fact that China is not bound by the INF Treaty constitutes a source of significant concern for Russia. We currently face troubling times in matters of arms control, as treaties are unraveling, there are few prospects for new ones, and the arms race is showing signs of revival. Regardless of their actions, both the U.S. and Russia claim they do not wish to withdraw from the INF Treaty. However, the agreement, primarily designed to deal with nuclear capabilities, constrains both countries in the realm of conventional weaponry, which has grown in importance in later years given the need to respond to new threats which have emerged as a result of technological developments, such as remotely piloted vehicles. In addition, the treaty, while also binding Belarus, Kazakhstan, Ukraine, Turkmenistan, and Uzbekistan, remains essentially a bilateral agreement between Russia and the United States. Making other countries, such as China, Iran, Pakistan, or India adhere to the INF Treaty would soothe Russia’s concerns, and contribute to regional stability, not to mention strengthen the non-proliferation regime worldwide. Therefore, it is important to bring all relevant parties back to negotiation table, and address mutual issues of compliance between the U.S. and Russia (thus avoiding forced adherence through military operations in Europe). For that to happen, however, it is important that other countries are no longer silent – and especially those in Europe, who have the most to lose if ground-based intermediate-range missiles are again deployed in the continent. As the arms control framework is starting to crumble, it would be easier to build on what is already in place, then start from scratch, especially in a period of great distrust between the world’s two greatest nuclear powers.